Pro-Russian forces did not allow a group of military officers from the Organization for Security and Cooperation in Europe to enter Crimea. 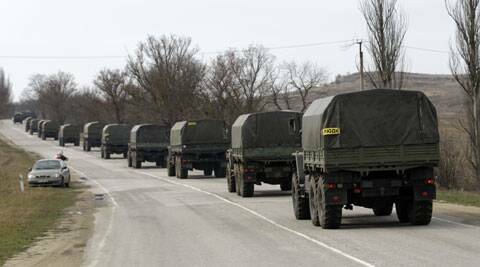 An Associated Press reporter says pro-Russian forces refused to let a foreign military mission enter Crimea on Saturday. After the officers had stopped, the armed men fired warning bursts of automatic weapons fire into the air to make other unidentified vehicles halt. No injuries were reported. The multinational group of military officers from the Organization for Security and Cooperation in Europe was attempting to enter the embattled peninsula from the north. The armed men told them they had no authorization to enter Crimea. The OSCE mission will likely return to the Ukrainian city of Kherson where it had spent the night, the AP reporter said. Russia and Ukraine are locked in a tense standoff over Crimea.